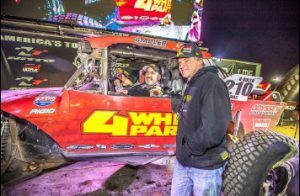 Browsing articles tagged with " king-of-the-hammers"
Compton, California (February 15, 2017) – 4 Wheel Parts President and CEO, Greg Adler, stepped out from behind his desk and into the driver’s seat to take his #210 Ultra4 Jeep to the finish line of what is widely considered the world’s most challenging single day off-road race – The 2017 King of the Hammers – this past weekend. The annual off-road pilgrimage drew tens of thousands of enthusiasts to the Johnson Valley Lake bed to race, cheer on competitors and celebrate off-road culture and lifestyle during the weeklong festivities. For Adler, his focus of leading the Transamerican Auto Parts significant marketing efforts throughout the week quickly shifted on Friday as he competed in the nearly 200-mile competition in which he faced a course that combined the high-speed challenges of open desert racing with technical rock crawling through canyons and over boulders in seemingly unpassable conditions. With the race’s opening miles covering an extensive desert portion of the course, he enlisted desert racing icon and multi-time winner of the Baja 1000, Rob MacCachren, to share duties behind the wheel and while MacCachren lived up to his reputation as one of the fastest men on four wheels in the dirt, the team faced its initial challenge of the day as the #210 approached the first serious rock obstacle. Now on the move, MacCachren found a pace that would set the tone for the day as he found the race pace with his meticulous driving style and expertise. At about the halfway point in the race, Adler began his stint behind the wheel and immediately began attacking the signature trails that have become an iconic feature of the event. As he made short work of Backdoor, Sledgehammer, Jackhammer and Chocolate Thunder, he headed toward the final and most challenging obstacles that stood in the way between him and the finish line. In those closing few hours, Adler was able to work his way through the final set of challenges before he made the last turn toward home, finishing with a time of eleven hours and twenty seven minutes. Of the 122 Ultra4 vehicles to take the start that morning, he was one of just 50 official finishers in this year’s edition of the epic race with a final position of 31st. For Team 4 Wheel Parts, the result capped a week that saw Greg Adler’s brother, Kevin bring home his #4830 Legends Class Car to the finish line in the prior day’s Smittybilt Every Man Challenge. Kevin Adler was also one of 50 cars to complete the race among a crowded field of 133 vehicles. Follow Greg Adler Motorsports on Twitter, Instagram, Facebook and Team4WheelParts.com. Compton, California (January 11, 2016) – Multiple Transamerican Auto Parts business divisions including off-road retailer 4 Wheel Parts, are returning as official event partners and sponsors for the 10th annual Ultra4 Nitto King of the Hammers in Johnson Valley, California. Transamerican Manufacturing Group (TMG) will sponsor numerous activities and events, including the Smittybilt Every Man Challenge, under the auspices of its numerous off-road and performance aftermarket companies that include Smittybilt, Pro Comp, Rubicon Express and G2 Axle & Gear. The weeklong “Ultimate Desert Race” featuring multiple classes from motorcycles to the high horse powered Unlimited Class 4400 Ultra4 cars runs from January 30 – February 6, and includes 4 Wheel Parts’ sponsorship of the Ultra4 qualifying sessions for the 4400 main race and the Smittybilt Every Man Challenge on February 4. Team 4 Wheel Parts racers Greg Adler, Brent Goegebuer and Kevin Adler are all slated to compete, with Greg Adler and Goegebuer in Friday’s 4400 marquee event and Kevin Adler running in the Every Man Challenge. As an official partner, 4 Wheel Parts will have a significant retail presence with their Showroom on Wheels providing parts and services for teams in addition to the tens of thousands of off-road enthusiasts expected to descend upon the region dubbed “Hammertown.” Parts and accessories such as tires, tow straps and winches will be available on-site along with expert advice from seasoned off-roaders. 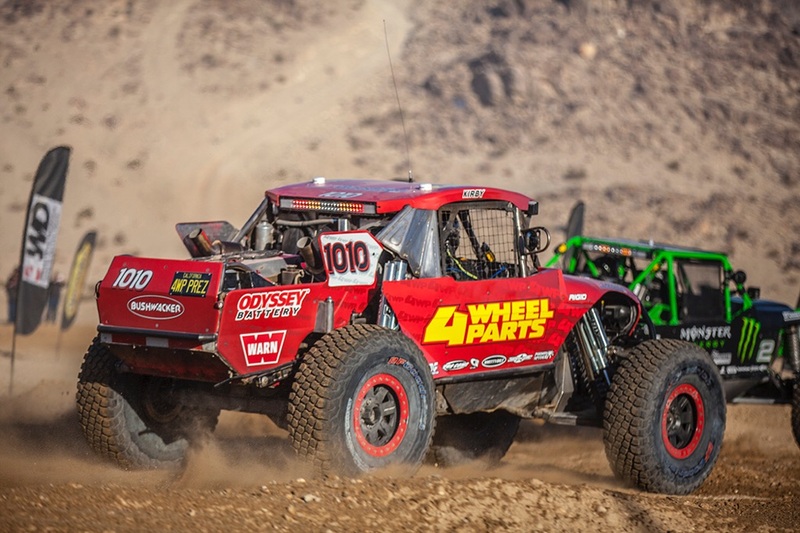 Complementing its sponsorship of the King of the Hammers Stock Class, Pro Comp recently launched its new Tire Racing Program helmed by Kevin Adler, offering racers in various classes the opportunity to benefit from special pricing on select Pro Comp Xtreme MT2 tires. Rubicon Express is also sponsoring Modified division and for the first time, the Legends class will have a sponsor in G2 Axle & Gear. The countdown to the 2016 King of the Hammers begins this Tuesday, January 12 as 4 Wheel Parts teams up with Ultra4 Racing to present the drawing for the Smittybilt Every Man at its Compton 4 Wheel Parts location. About Transamerican Auto Parts: Transamerican Auto Parts is the world’s leading manufacturer, wholesaler, and retailer of aftermarket parts and accessories for trucks, Jeeps and SUVs, including off-road tires and wheels and Jeep Wrangler bumpers. Transamerican operations are comprised of 72 4 Wheel Parts retail locations in North America, Transamerican Wholesale sales and distribution, Dealer Services International and the Transamerican Manufacturing Group which includes Smittybilt, Rubicon Express, G2 Axle & Gear, Pro Comp, LRG Wheels and Poison Spyder Customs. We Sell It. We Own It. We Live It. For more information about Transamerican Auto Parts, Dealer Services International and Transamerican Manufacturing Group, please visit: transamericanautoparts.com. Compton, California (January 27, 2015) – An agreement has been finalized between Transamerican Auto Parts (TAP) and Hammerking Productions that names TAP subsidiary, 4 Wheel Parts, the global leader in truck and Jeep aftermarket and performance products and installation, as presenting sponsor of the 2015 King of the Hammers (KOH) event. 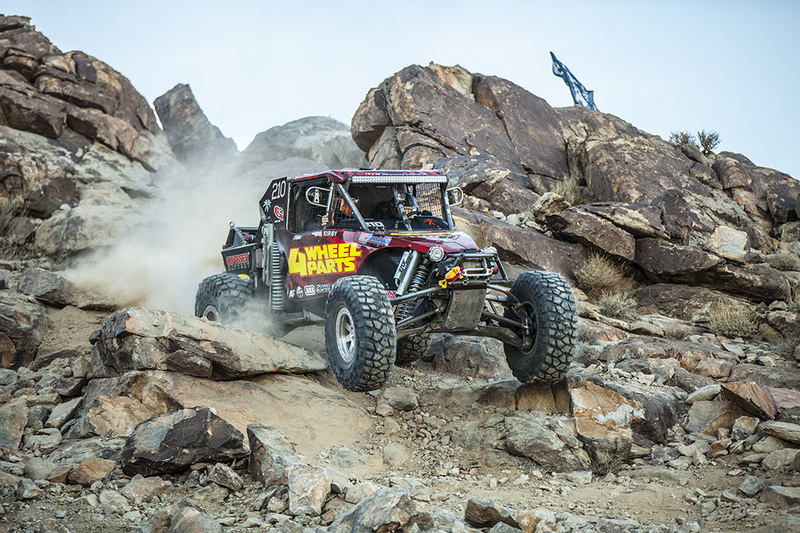 The alliance enhances Transmerican’s existing support of the weeklong event which includes title sponsorship of the Every Man Challenge race by Smittybilt, a division of the Transamerican Manufacturing Group. This year’s 215-mile course spans through Johnson Valley, California, blending technical rock climbing with high-speed desert racing. King of the Hammers is renowned as the most grueling one-day, off-road race in America. Helmed by Hammerking Productions President Dave Cole, the King of the Hammers has grown from a small gathering of competitors into a nationally-acclaimed occasion attracting immense crowds flocking to the California desert to watch participants from across the globe scale creatively named obstacles and race purpose-built vehicles across the open terrain. An estimated 60,000 people descended on the Means Dry Lake Bed in Johnson Valley in 2014 for the King of the Hammers. Close to 400,000 viewers took in the off-road action courtesy of live internet broadcast, establishing it as the largest watched off-road racing event in the country. “There is nothing like it in all of off-road,” concluded Adler. 4 Wheel Parts is the global leader in off-road, Jeep and aftermarket performance products. With 67 locations across the US and Canada and growing, 4 Wheel Parts Service Centers install all the products they sell. With the nation’s largest inventory of off road tires, wheels, lift kits and accessories, 4 Wheel Parts serves customers across the country and around the globe. Life is Better Off-Road™. Visit us at 4wheelparts.com or call toll-free 877-474-4821.